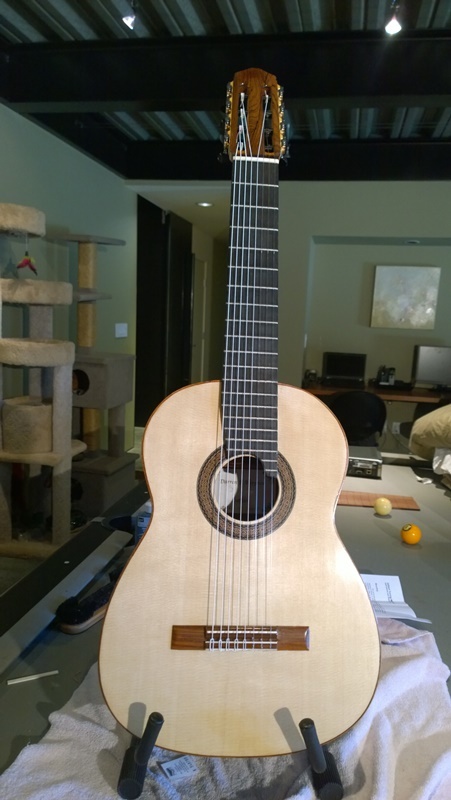 www.KitGuitarsForum.com :: View topic - re-topping an Hippner 8 string with a falcate spruce top. 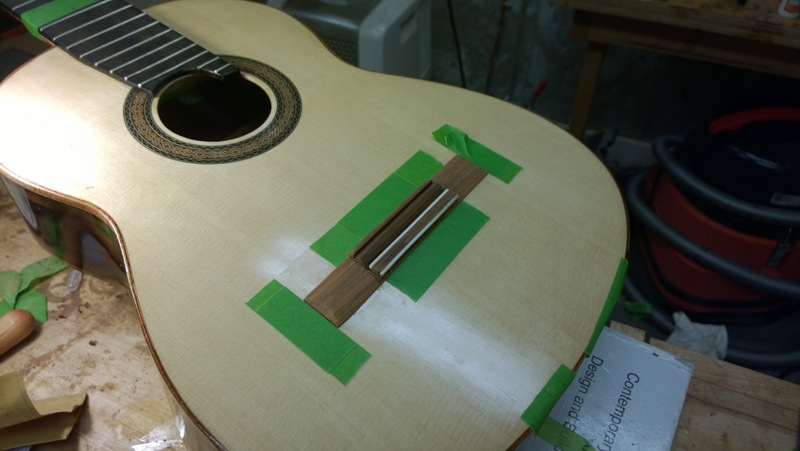 re-topping an Hippner 8 string with a falcate spruce top. 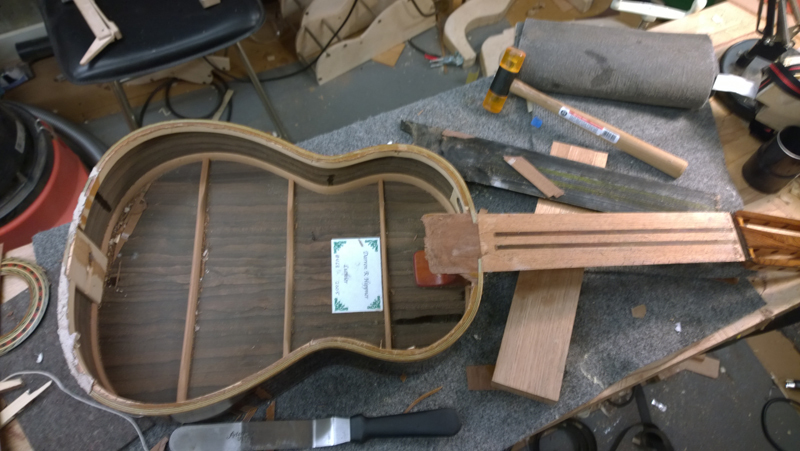 Post subject: re-topping an Hippner 8 string with a falcate spruce top. This is a little different for me. 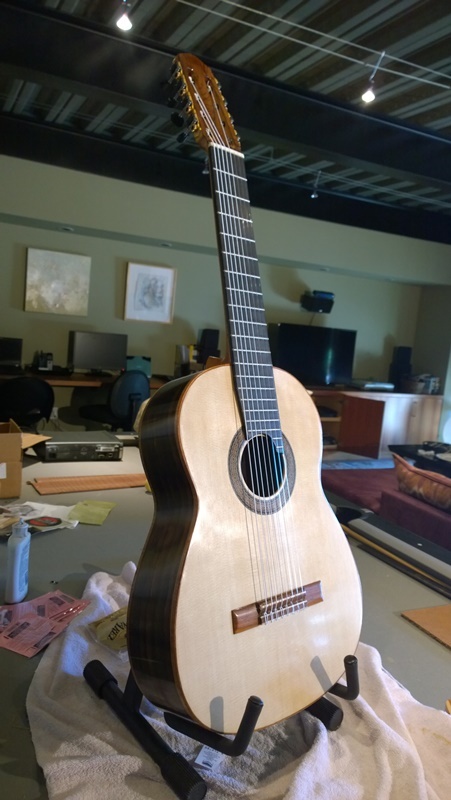 A player that I know had a very damaged Hippner 8 string guitar. He had two accidents with it and had destroyed the lower bout of the top. He thought it a total loss so I asked him to bring it over. I pulled it apart, all and all it looks very nicely made and is in good condition other than the top. The WRC top was amazingly thin at 1.1 mm. It had a spruce lattice bracing. 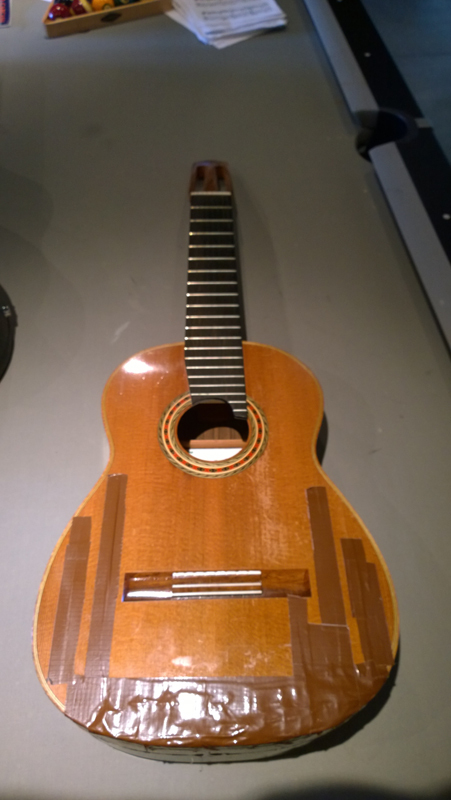 It probably sounded great but it was a little fragile as a gig guitar. The top was a total loss. 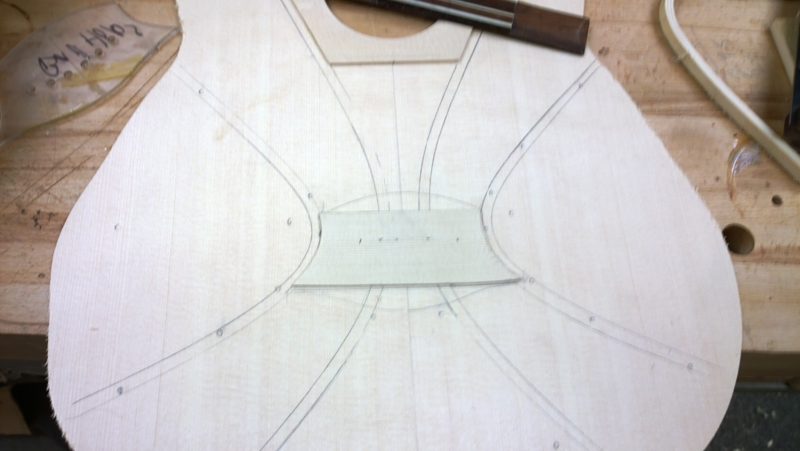 I thought about trying to keep the old bindings\purflings because the linings that support the top were wide enough. I ended up pulling them as my top was a mm thicker than the old. I would have needed to drop the new top in. I have matching koa bindings that I can use as a replacement. The insides looks good. 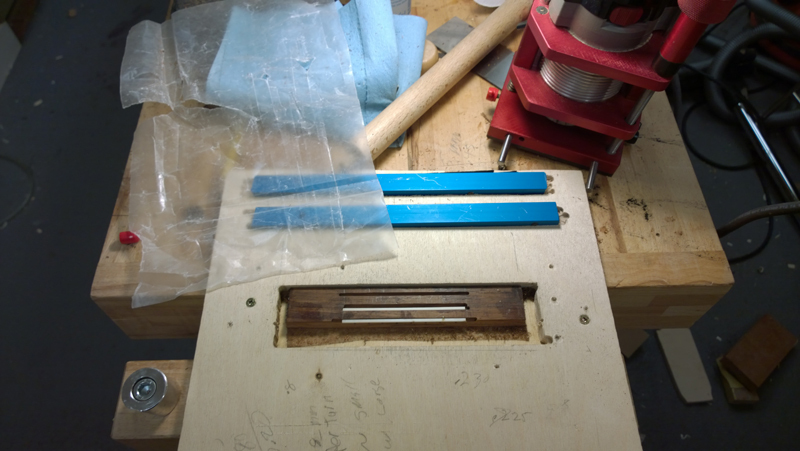 I got the fret board off cleanly so I will be able to reuse it. There were some cracks in the sides that were repaired, with the top off I cleaned up those repairs and make them more permanent. I also had to fix a few other side cracks. 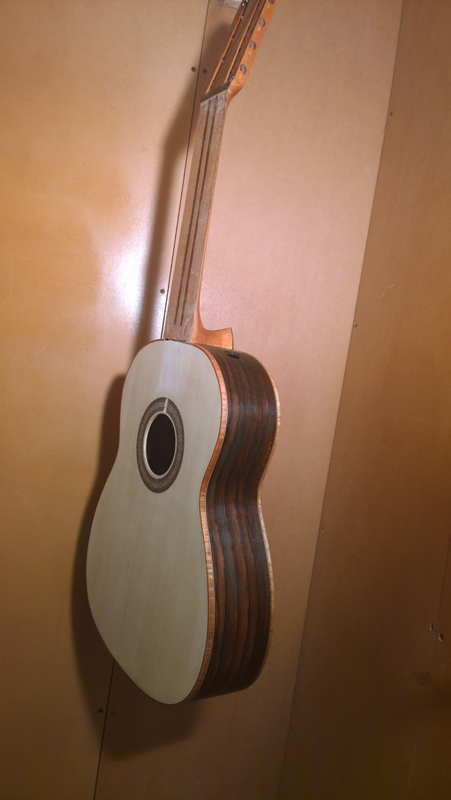 I currently have the instrument re-topped and I am in the process of french polishing the top. 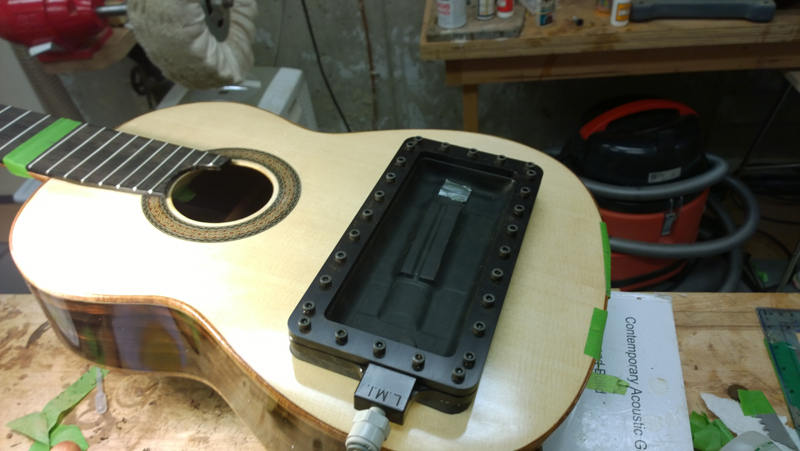 I did use a falcate pattern, the molds I have for my Hauser guitars worked fine. 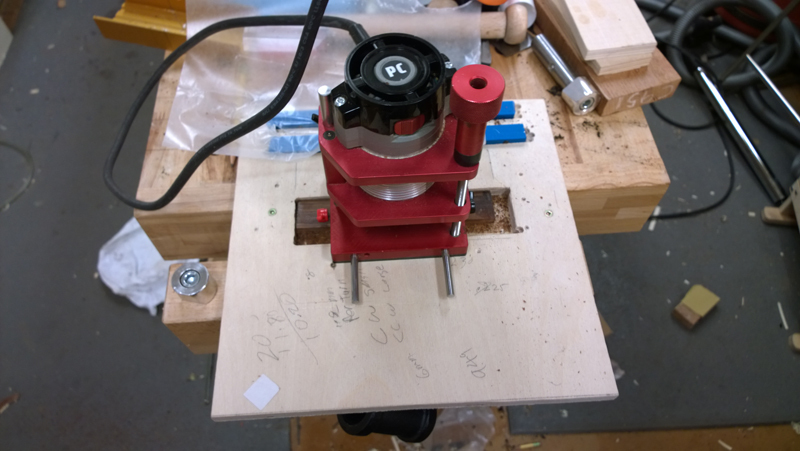 I also followed tomigv suggestion and used CF under a 1 mm bridge plate. To add a bit more lateral stiffness I built A new BRW bridge with CF laminated in the block a mm below the top of the bridge. 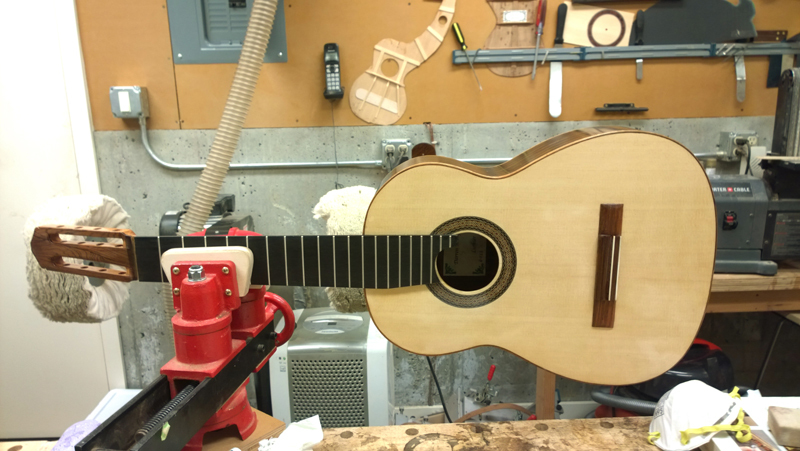 To match the geometry of the original guitar I built the top in my solera that is dished out for a 25' radius. 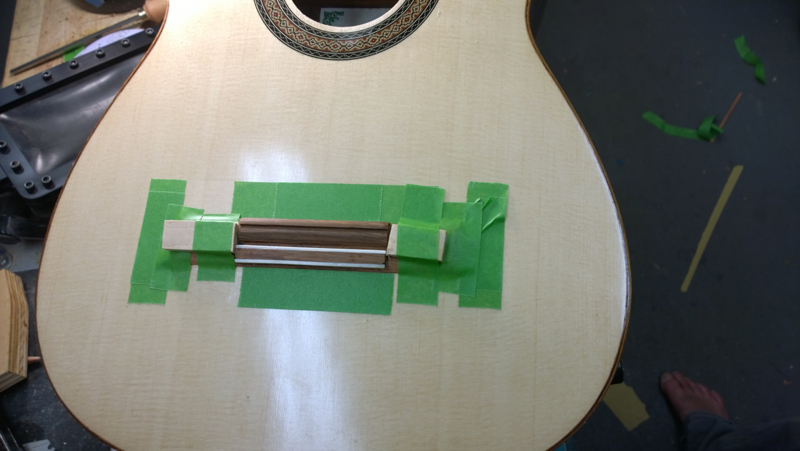 Basic brace pattern with bridge plate. (a cut down version of the SS bridge plate form the book. 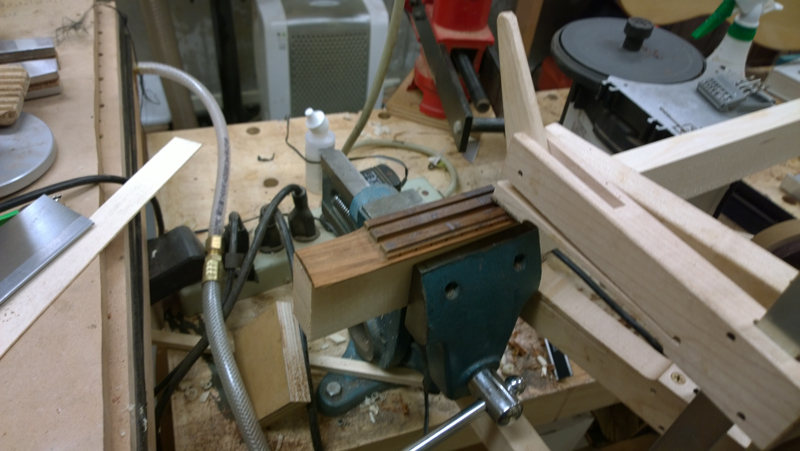 Built the bridge in my handy classical bridge making tool. A simplification of the jig in the book. I cut the wings with a razor saw and a band saw and then used a rasp to shape them. 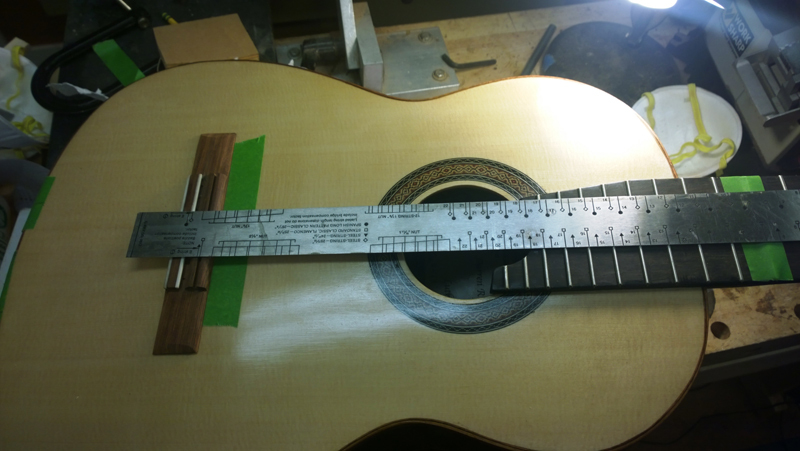 Today I glued on the fret board, sorry I did not take pictures and installed the bridge. I normally use locator pins but I glued some K&K pickups on the bridge plate, and did not want to drill through them with locator pins. 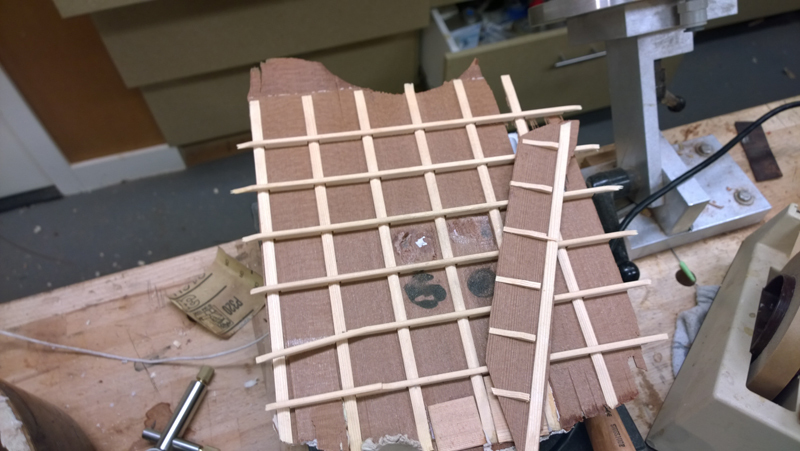 So I set the bridge carefully, using scale and compensation measurements and boxed in the location with tape. With the bridge taped down. 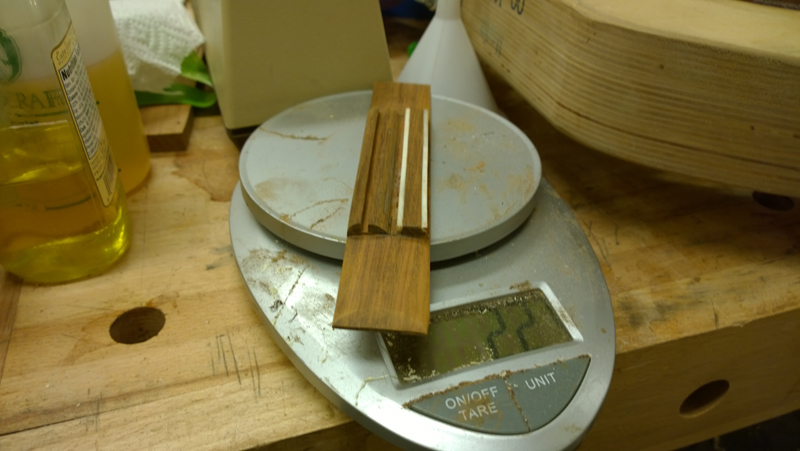 I traced the profile with a scalpel and cleared out the shellac from the bridge location. Here are some pictures. 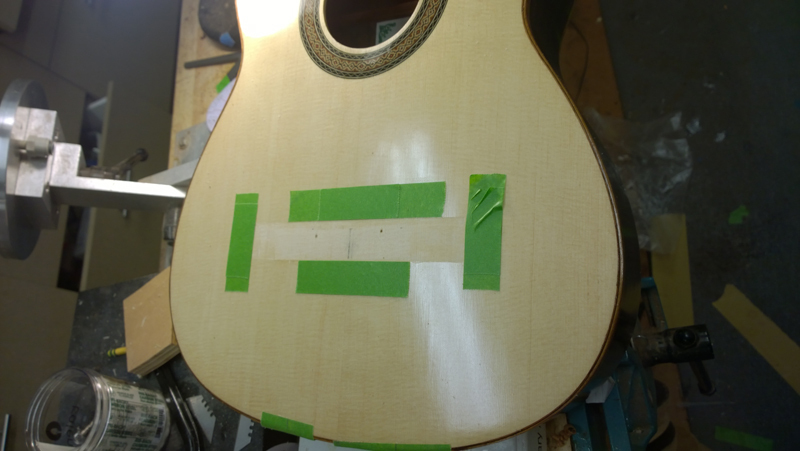 I still have finish touch up and surprise, none of my saddle blanks are long enough for an 8 string saddle. But it looks like the re top came out looking ok.
IIRC: Quite awhile ago, I bought a set of BRW from an ebay vendor named Hippner. Same guy...? Thanks, My guess he is the same guy. He is quite a prolific builder, having excess sets to sell would make some sense. I strung her up and she sounds pretty good. 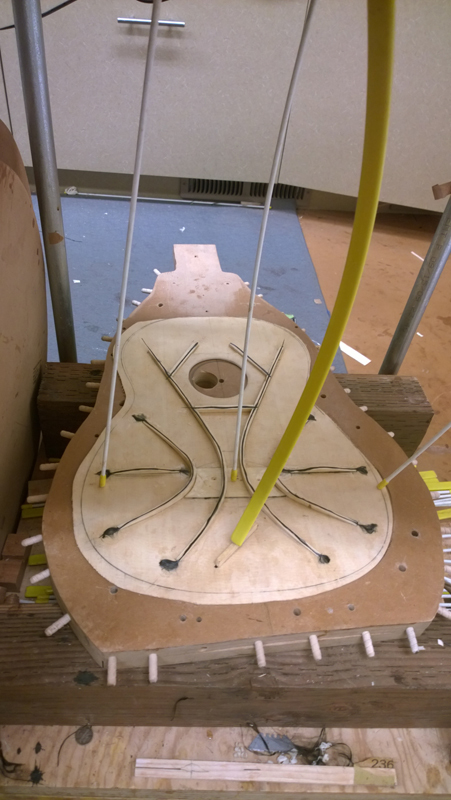 So far I am using the original nut and saddle unchanged. I need to take about a MM off of the saddle, to nail the action. 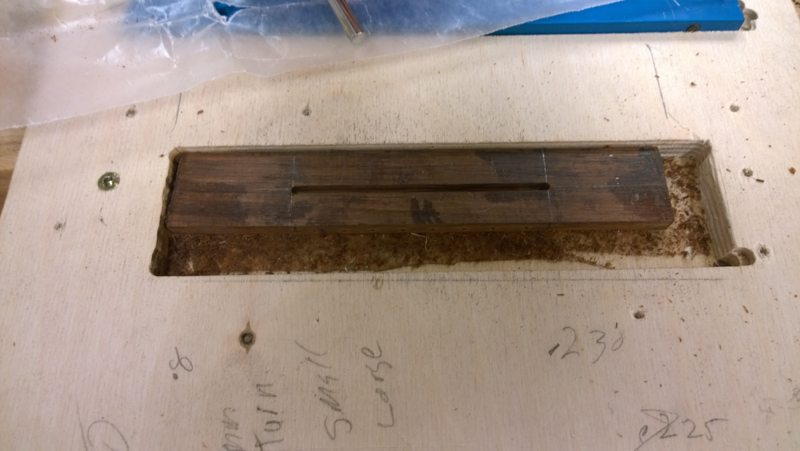 I think my bridge slot was not quite as deep as the original bridge. I also need to take a bit off of the nut slots. 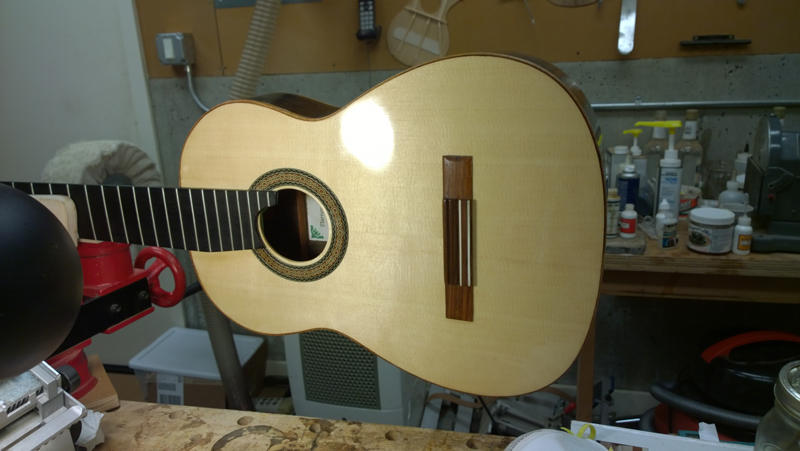 I am going to wait a few day to let the top settle in on a tonerite before I finish the setup. Finish sure looks good on that top John. Nice!